Like most of my stories, this post is going to take a meandering path, so please hang in there with me. When I was a child, my dad and my uncle used to take my cousins and my sisters and I to Starved Rock State Park in Illinois. We would camp there in the Fall. It is a beautiful place, with ravines that rushing water carved out thousands of years ago surrounded by high jagged rock walls. It’s not nearly as big as the Grand Canyon but it is lush with trees and moss that is beautiful when Autumn’s paint brush turned the landscape into a mixture or greens, golds and reds. At the time, there were no “off-limits” zones and my dad and uncle would have us scaling rock walls that no children had a right to be climbing. Or we would have to walk along ledges, with our back to the rock, sidling on overhangs that were barely longer than our feet (and hundreds of feet from the ground). If that wasn’t dangerous enough, one of them would say something like, “Oh and watch out for snakes as you walk.” It was extremely dangerous and ill-advised and we loved it. Flash forward many years to when my brother was born. By then the park had realized it was probably not a good idea to have anyone and everyone scurrying willy-nilly up the side of cliffs, so they roped most of them off. But it was still a good time. When traversing the area, we would often come across creek beds that were dry by the time we arrived in Fall. Yet in the Spring, they would be brooks and rivlets that could be unexpectedly dangerous. Little signs were posted reading “Beware Of The Under Tow”, which became a bit of a joke to us as we took to calling it “The Under Toad” as if it was a little character that liked to pull pranks. Okay, here’s the part that brings that whole story back home. Like many people with TN – or other conditions – I’m heavily medicated. And one side effect is what we call “Brain Fog”. Somehow in my goofed up brain, I now refer to it as “Brain Frog”. I try not to, but it still happens. So, I’ve decided to go with it and give the Brain Frog a little personality of its own. 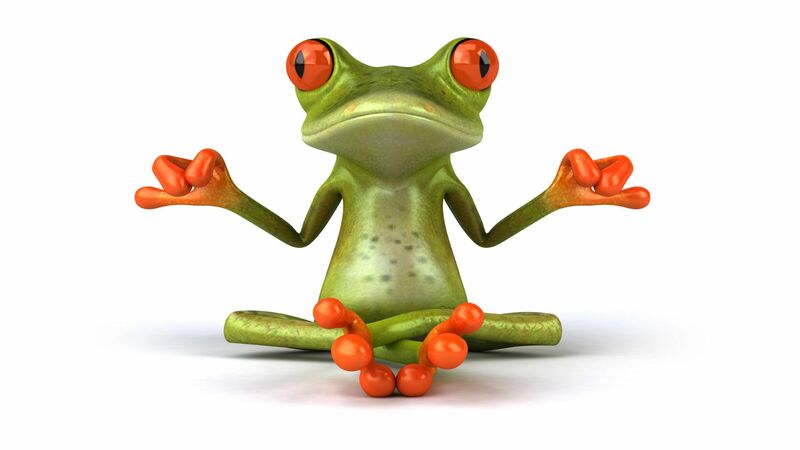 It is the Brain Frog that makes me forget things or do something stupid or zone out. It sort of takes the pressure off of me to think of it that way. I’m sorry I made you punch 14.00 into the microwave instead of 1:40. And it was I who caused you not to notice my mistake until the damage was done. I realize cleaning up the oatmeal explosion in the microwave was not on your schedule for today. I will do my best to make sure it never happen again. Have you had a Brain Frog moment yet today? In my case, I’m sure this will not be the last, but at least I’ll have someone else to blame. Fab post. Your frog is not alone. I admire your sense of humor as you navigate TN.